Sometimes you just need to put a hole in the glass! There are two ways to go about this. You can use a drilling bit to make a hole or you can use a core bit to remove a core of glass and leave a hole. 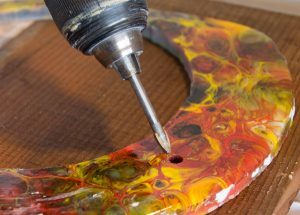 The difference is that a drill bit will create the hole size that it advertises, but the core bit will create a circle of glass in the size that it advertizes. The hole left in the glass from a core bit drilling will be slightly larger than the core bit size. Both methods require it be drilled with water! GAI speedbits have a carbide tip designed to drill through hard surfaces. Not only do carbide tips last longer, but it will keep your bit from "walking" as you begin to drill. Works best in a standard drill and can drill in glass, granite, marble, quartz, cermaic and porcelain tile. The size shown is the size of the hole that tip will create. Be sure to use water for lubrication. Diamond drill bits require the use of proper lubrication, correct drill speed and proper pressure. These unique diamond-coated drill bits will grind clean holes in glass more effectively than any other drill bits on the market. Simple to use and fit any portable electric drill. Core drill bits have a hollow center and cut a circle in the material to create a hole. This results in a hole the size of the drill and a smaller "plug" or "core" which comes from the center. Just add water for lubrication. All diamond core drills have shaft sizes of 3/8" (10 mm) or less, for use in most standard drills and drill presses. For Drilling holes in Glass, Ceramic Tile, Stone, Fiberglass or Plastic. All bits have 1/8" shank for use in most standard drills and drill presses. 4 Pc. Diamond Core Bit Set. One of Each.